Can’t figure out your budget? You’re not alone. If you’re anything like me, when you want to redesign your space — whether it’s your home, office or healthcare practice — you want it done and you want it done NOW. You’re tired of that old carpet or that awful wall color or your waiting room that feels like it’s still stuck in the 1990’s. And it’s been bugging you (and most likely not inspiring your patients or staff either) for some time. Next, your mind starts thinking and oodling. You start surfing the Internet looking for inspiration, swinging deals and what’s new on Pinterest. And then, just as you’re thinking, “YES, I’m gonna buy that *thing* to bring some LIFE back into my space…” something stops you. That something, my friend, is the four letter word: FEAR. Doubts of “Am I doing the right thing?” can come up, you get overwhelmed and nothing ends up happening to move you towards your goal of creating a patient-centered, nurturing space that helps build your business. I’ve been there. I get it. And guess what? 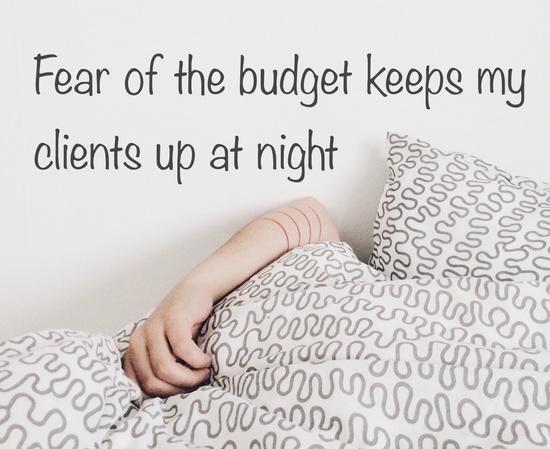 One of the biggest problems that keeps my clients up at night is fear of the budget or FOB. FOB is not knowing how to appropriately calculate what things cost to create the healing space you truly desire. And that can be SUPER stressful. I’ve recently done something to help eradicate FOB, so that you can feel at ease and confident about taking the right steps within your budget to move forward with creating a patient centered space you and everyone around you loves. If you’re ready to start a design project, get the help you need here.